Bob Williams is a “dreamer extraordinaire” with a life-long passion for speed on two wheels. At 14 Bob acquired a 125 cc BSA Bantam for $50, its frame and wheels rescued from a chicken coop, engine in a bushel basket, all resplendent in feathers and related chicken crud! Following a basement restoration job, the ambitious neophyte rider set off on his initial test ride…facing the stairway! Bumps and bruises testified to a less than successful first flight. Undeterred, he was hooked for life! At tech school, Bob made a foundry pattern and cast an aluminum intake manifold for his 500cc Triumph, machining it to accept two 1-1/8” Amal carburetors for its cast iron cylinder head. It was an early harbinger of his quest for speed. Bob bought several basket case Triumphs, making the ninth one a runner that would carry him to California. He was nothing if not an optimist! 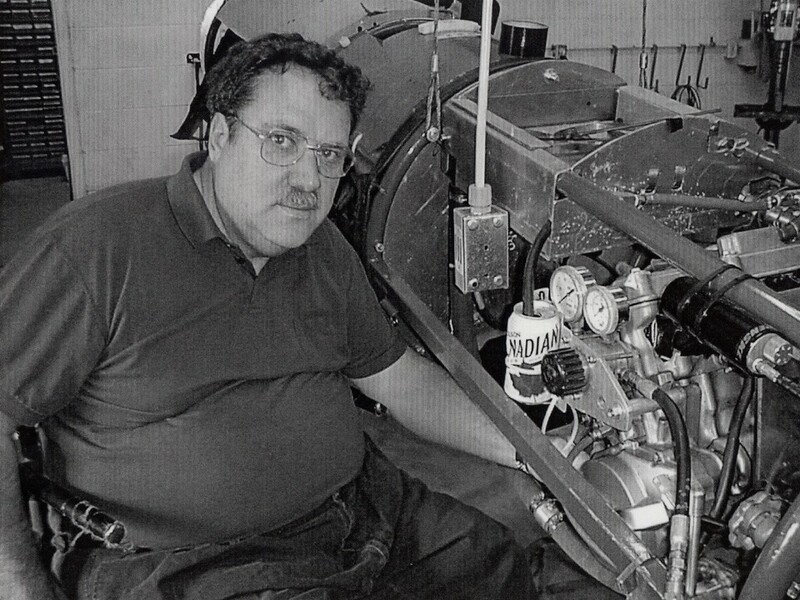 In 1965, Bob Leppan of Detroit invited him to join the crew of the Triumph-powered Gyronaut streamliner on a $100,000 odyssey to set a land speed record. Other obligations at the time precluded his accepting, leaving Bob with a regret he carries to this day. Especially so, since Leppan and crew went on to establish a world record of 245 mph! Bob Leppan had surely piqued Bob Williams’ interest in motorcycle speed records, though! Road racing in Ontario was on the threshold of a major breakthrough at the time. Excited by this trend, Bob bought a 250 cc BSA C15 and went racing at Harewood Acres near Jarvis. In ’67, he would step up this programme considerably by acquiring a state of the art TD1-C Yamaha 250cc production racer and campaigning it at Harewood, Mosport, and Grattan, Michigan. 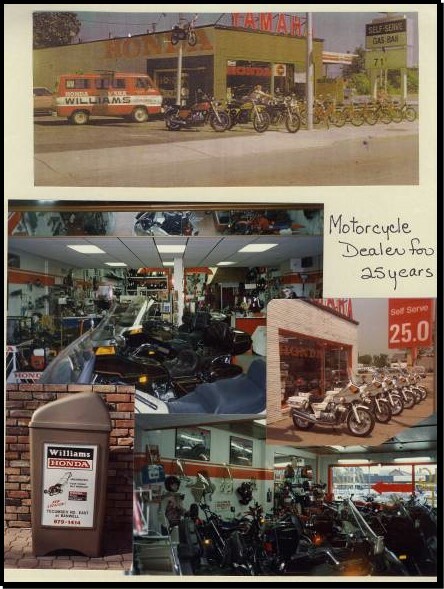 Also in ’67 he opened a motorcycle shop on Walker Road in Windsor. In 1968 he became an authorized BSA dealer and began a venture into drag racing. He built a Triumph drag bike that recorded 12-second quarter-mile times. He added Yamaha motorcycles to his dealership line in 1968 and also diversified into the manufacture and distribution of motorcycle accessories through a second company, ZIP Canada. Bob took on the Honda line in 1970 and in recognition of his great sales efforts earned a trip to the Honda factories in Japan. 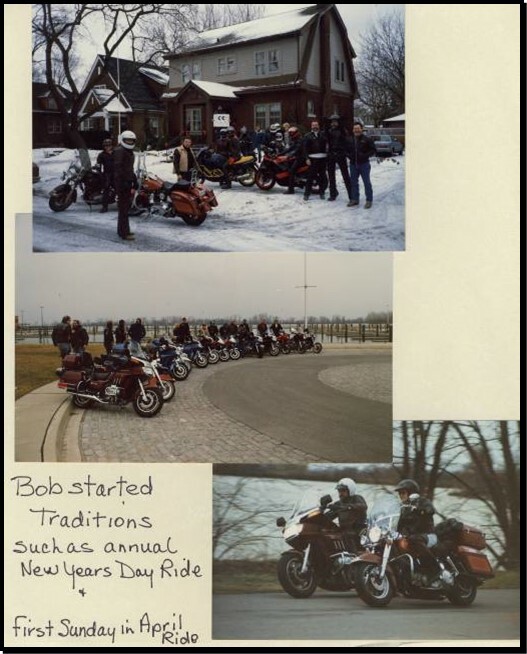 In ensuing years, Bob was active in the promotion of rider training, providing guidance and lending motorcycles to St. Clair College. The Ministry of Colleges and Universities recruited his expertise as a member of the Board for four years. He donated another four years as general advisor representing motorcycle dealers. He also chaired a committee that rewrote the safety inspection standards for the province of Ontario. With the motorcycle industry experiencing a down cycle in the late 1980s, Bob took on an additional business venture, a mailing company. This venture was to present formidable challenges but Bob prevailed and made it successful. 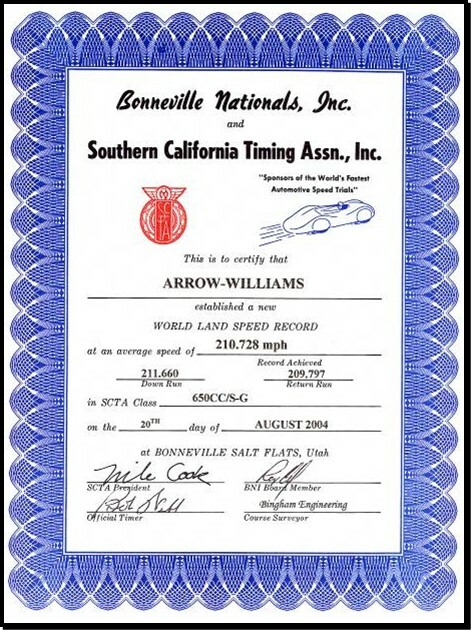 The company was named Arrow Mailing, a name that would feature on the yet to be created Team Arrow Racing. 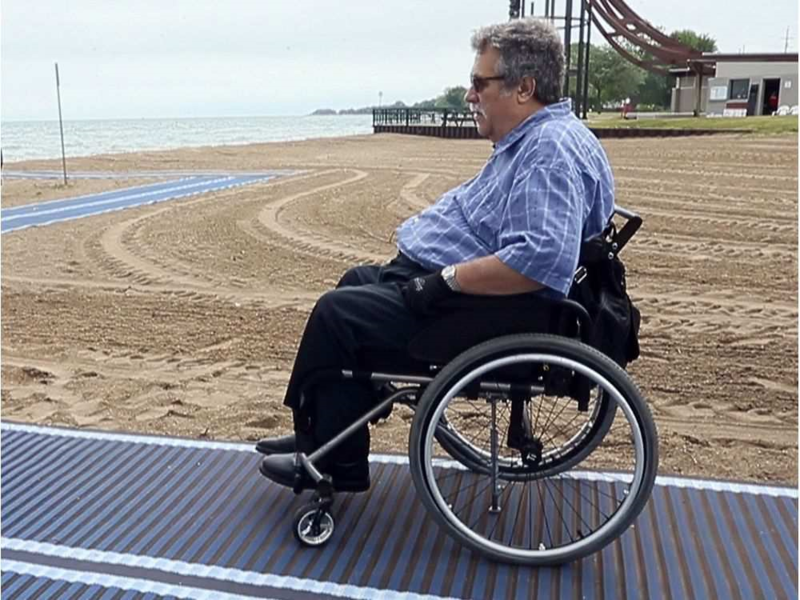 In 1990, Bob’s life would take a dramatic turn, being involved in a motorcycle accident that left him paralyzed from the waist down. 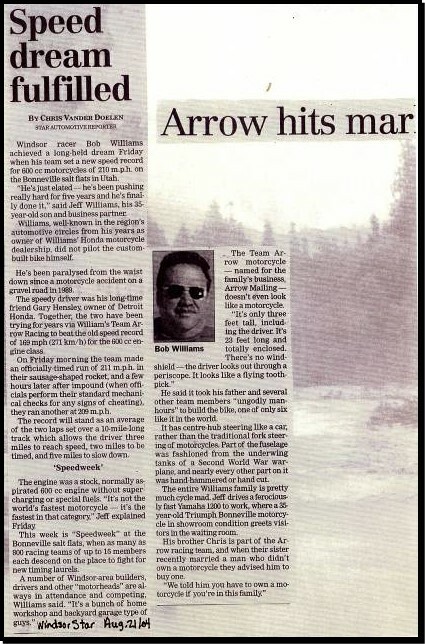 His eldest son Jeff managed both the bike shop and Arrow Mailing in the time Bob was hospitalized. Given the state of the motorcycle industry at the time, they made a decision to close the shop. 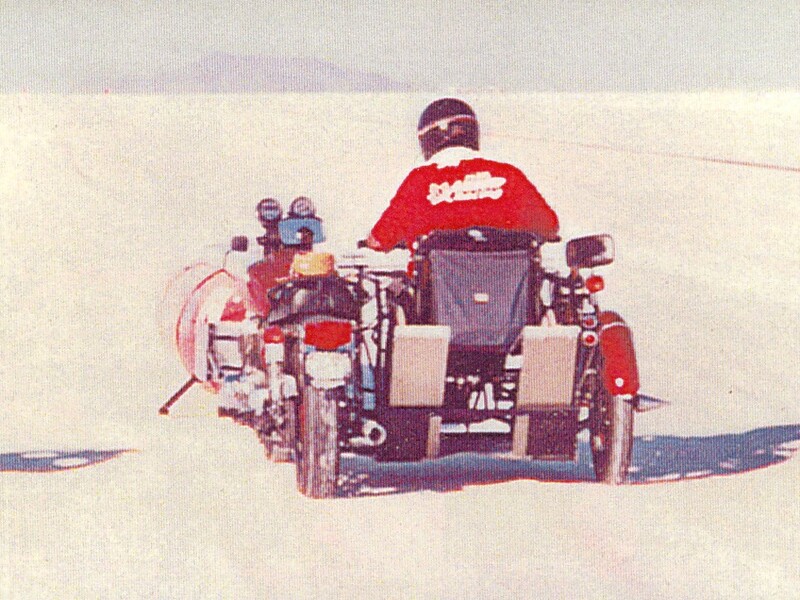 While now challenged physically, Bob’s mind went into overdrive with his long-held dream of the Bonneville Salt Flats. Restrictions imposed by his wheelchair caused him to design and build a three-wheeler using a Honda 750 Automatic that would accommodate the wheelchair. Bob was now to focus on Bonneville and land speed records. For his initial Bonneville project Bob designed and constructed a turbocharged 350cc Honda four, where the rider sat ahead of the engine. Where do you test a potential land speed record machine in Windsor? Local drag strips and small airports would suffice while keeping a wary eye out for aircraft! In 1997, with son Jeff piloting the 350 Honda, they reached 156.5 mph. Just shy of the record, which stood at 156.9! The following year they recorded 163 mph but unfortunately suffered engine failure. Back in Windsor, with fire in his belly, the streamliner was born with the purchase of an F14 fighter jet drop tank. 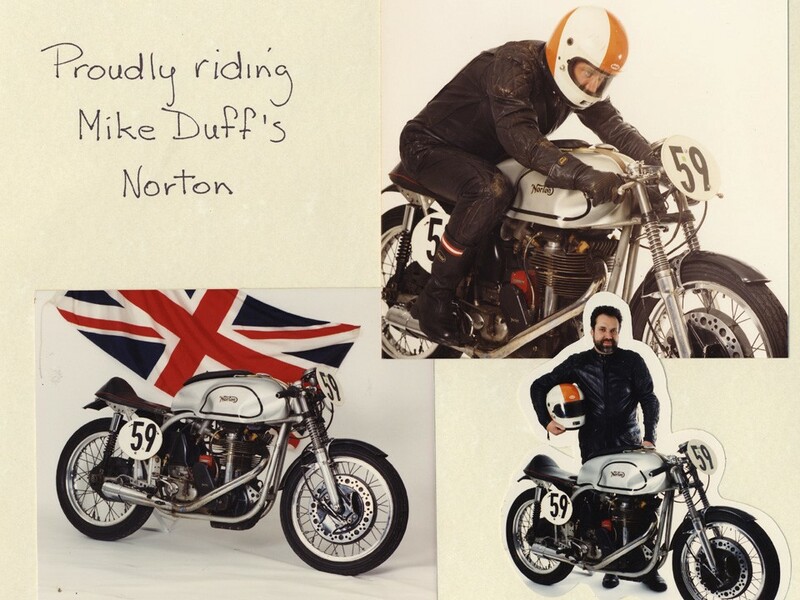 The following year, both bikes were back at Bonneville. This was a testing exercise with Bob starting the unit by pushing it with his wheelchair transporter. 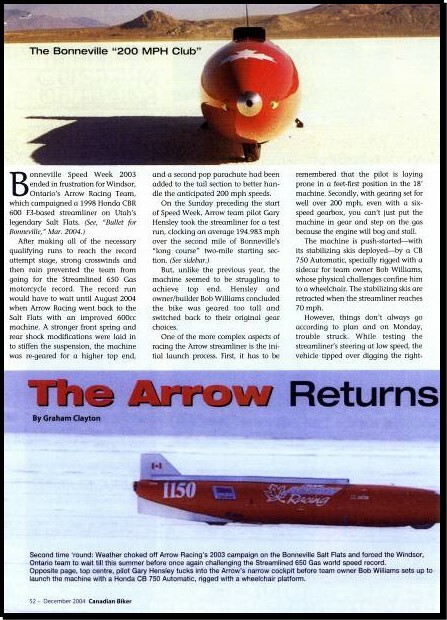 Designing and building the Team Arrows' streamliner makes a fascinating story of endless hours of work, many dollars invested and a dedicated team required. Under Bob Williams’ leadership, and no doubt inspired by his motivation and drive, the project was completed and would go on to make history! 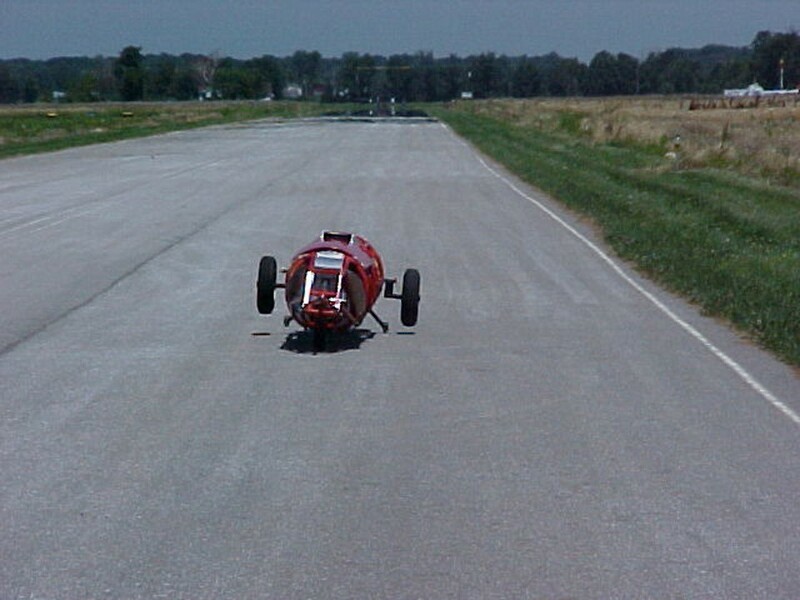 In 2003 the team went back to perform licensing runs with a top run at 201.276 mph, in readiness for a record attempt in 2004. 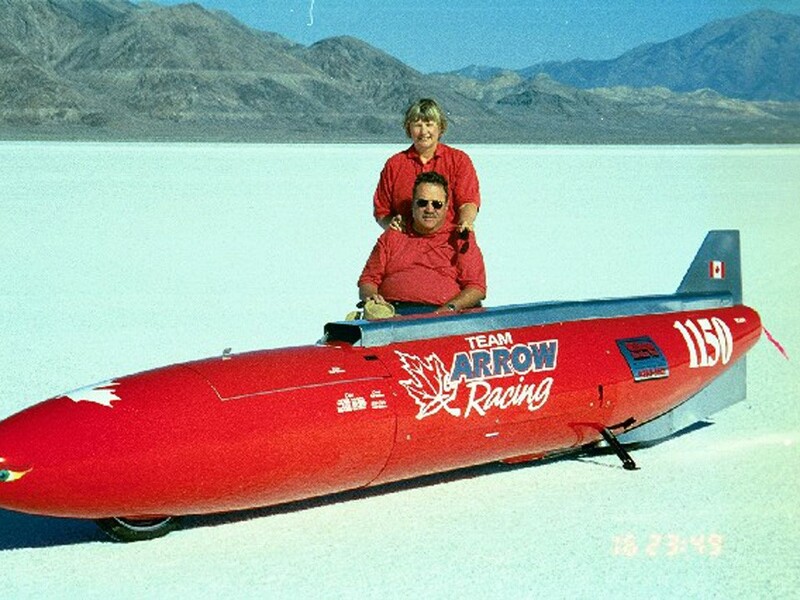 Bonneville 2004 was indeed a breakthrough year for Bob Williams and Team Arrow Racing. 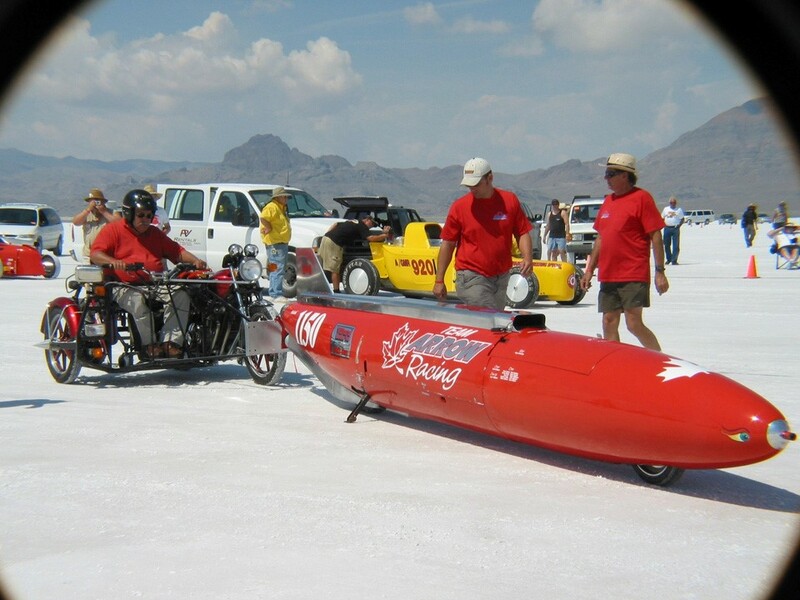 With Gary Hensley at the controls, they shattered the 650cc gas record by 42 mph, in the Honda CBR600-powered streamliner. They also established a class speed record for motorcycles at 210 mph, lofting Gary into the exclusive 200 mph club. Having reached the 220 mph mark, in less than ideal conditions and with technical problems, they decided that 250 mph was an achievable goal!